The year was 1984… The place, Chaya Brasserie in Beverly Hills… The man, Chef Shigefumi Tachibe, i.e. the man credited with creating the first “North American” tuna tartare. Consuming raw fish to appreciate the delicate texture, flavour and purity of its flesh, began somewhere around the 8th century in Japan. The consumption of raw or preserved fish actually goes further back to southeast Asia, but the sushi we are accustomed to only took hold when the Japanese perfected this during the Edo period. Thank you Japan! Because of our new found obsession with raw fish, the possibilities were endless and chef Tachibe took it to new heights when faced with picky clients that refused his classic beef tartare. 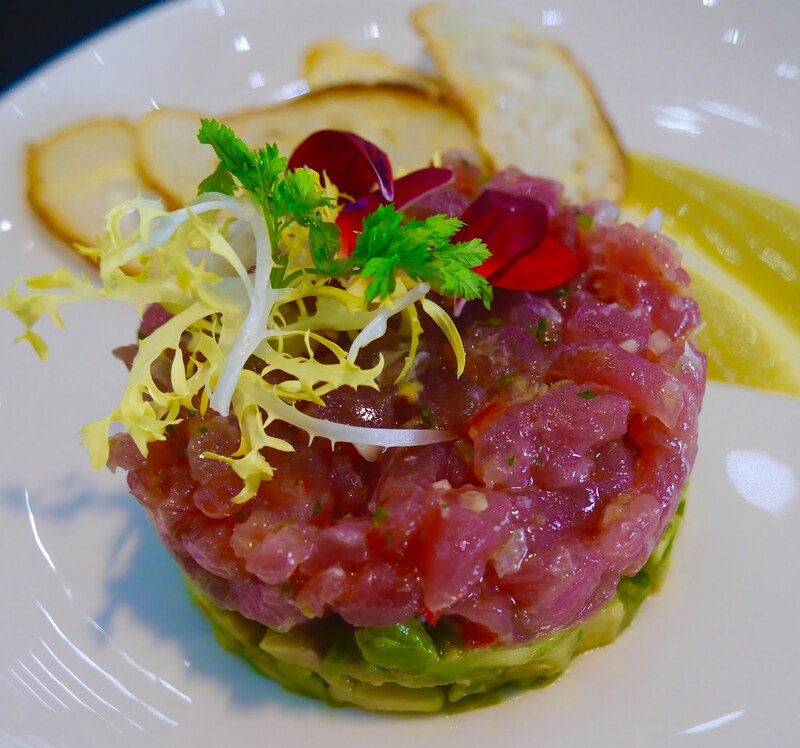 This trend exploded and before we knew it, tuna tartare was a star on almost every menu in North American restaurants. Thank you Chef. Tuna tartare recipes are a dime a dozen, that being said, this one is my favourite. It has great flavour, it’s beautiful and it is a crowd pleaser to say the least. Give it a try, it’ll put a smile on your face. Cut tuna into a small sized dice by slicing long strips against the grain and then chopping up into desired size. Keep tartare in a chilled bowl, season with salt and pepper and drizzle on the oil. Mix well, cover and refrigerate while preparing garnishes. Slice baguette, drizzle with olive oil and sprinkle with sea salt. Place under the broiler and pay close attention for 2 to 5 minutes. In a mixing bowl mix together the shallot, chives, thai basil, parsley, mustard, lemon juice, sherry vinegar and olive oil. Whisk to combine. Cut avocado in half and remove pit, then remove flesh with a spoon and cut into a small dice. Gently fold the avocado into the mixture to prevent oxidation (turning brown). Add tuna to this mixture and mix just to combine. Do not overmix as tuna with turn brown with incorporated air. Right before plating, gently mix in the crushed chips. Serve tartare with warm croutons and a small salad for a main course or plate individual croutons topped with tartare and fresh herbs for a beautiful summer hors d’oeuvre!